So, you're sitting in traffic and a fragment of a melody pops into your head. You don't remember what the song is, but you know, it goes like this: Dah. Dum. Dum. Dah! You call your friends singing that little phrase. You get nothing, except maybe aggravation and a suggestion to focus on your driving. That's where Name My Tune comes in handy! 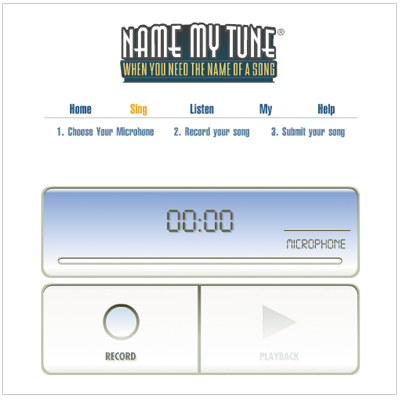 You can jump on this website, record your little diddy and send it out to the masses for tune recognition (using something as simple as your built in mic). You'll get emailed suggestions of tunes and artists. An invaluable resource to cure that it's-at-the-tip-of-my-tongue syndrome.